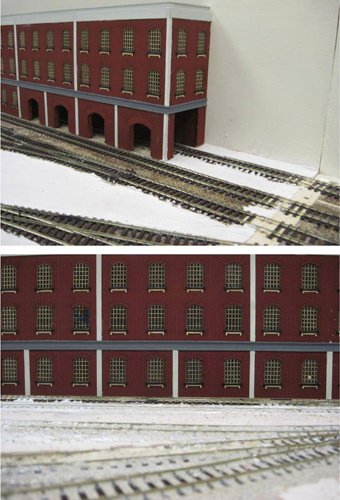 Bradley Park is a small layout, 8ft x 2ft (not including the fiddle yard), depicting a set of rail served industries. The idea was to make the layout as non descript as possibel where time and region was concerned. This was so that we could run as wide a range of stock as possible from any region, though not at the same time. For instance one week could be North Eastern steam, another week Southern steam or another could be BR blue deisel. 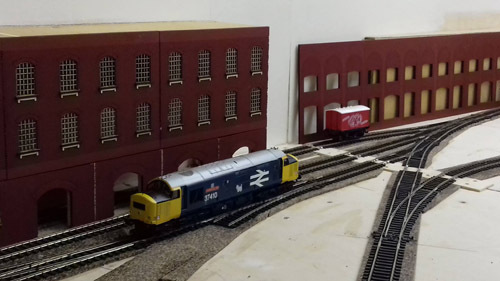 The builldings have been designed to be as generic as possible so are all made from brick as we felt any stone buildings would place the layout in a certain local. Bradley Park has been named in memory of Paul Bradley, one of our clubs long standing members, who sadly passed away recently. We are very pleased that his family let us honour him in this way. 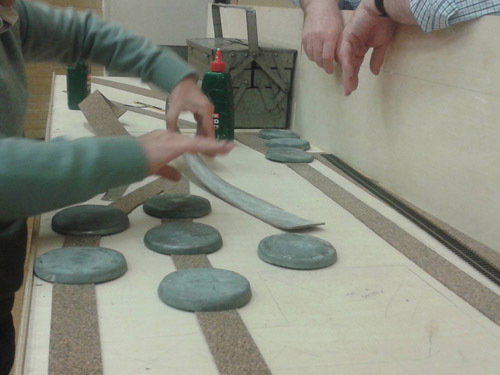 The layout was also started to help promote the club and encourage new members to join and learn new skills. 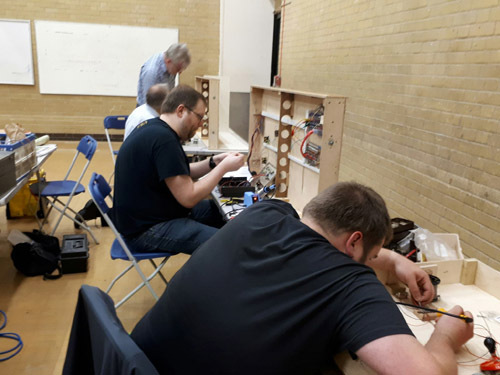 To this extent it has been very successful and we have several new members who have joined and have learnt how to lay track, solder, wire up switches and develop scenery techniques. 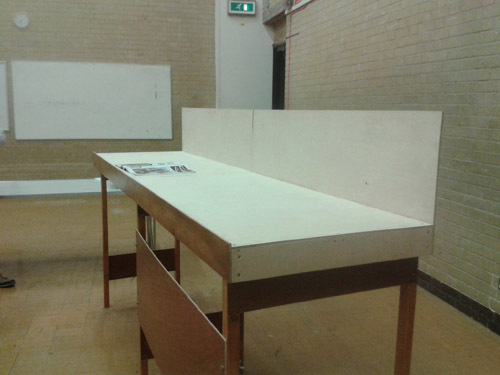 Some of the more established members have scratch built some of the buildings, either from plasticard or laser cut from thin mdf. 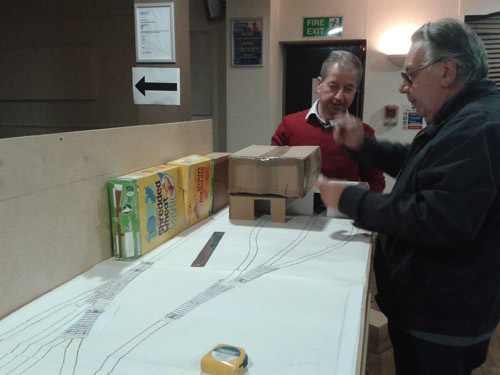 The track plan was drwan on to a roll of paper and building mock ups were made from cardboard boxes to get an idea of size. Cork underlay was stuck down for the track bed and heavy lead weights used to keep it in situ. Track was layed, stuck down with pva adhesive. 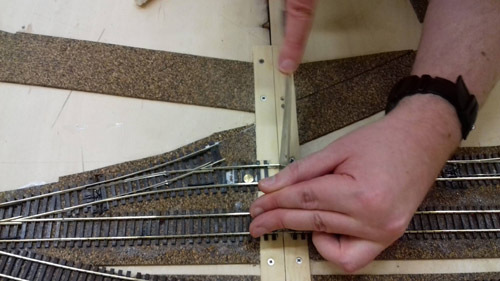 Rails were attached to either small brass screws or copper clad sleepers at baseboard joints and then cut with an Exacto saw. The three way point was to hand made using the template above. This was so we could have the top most leg taken out of use with only the bottom two roads switchable. 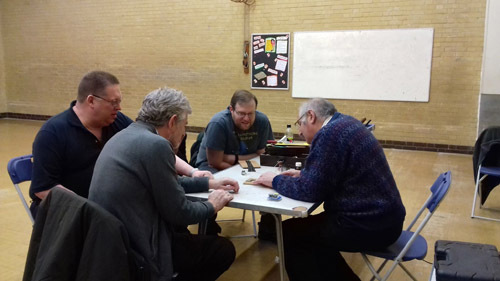 A small group of club members led by our exhibition manager, John (right), discussing how to assemble a hand built turnout. 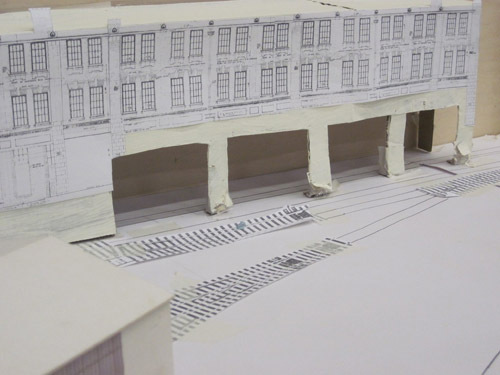 Printed mockup of one warehouse along the back scenic break. 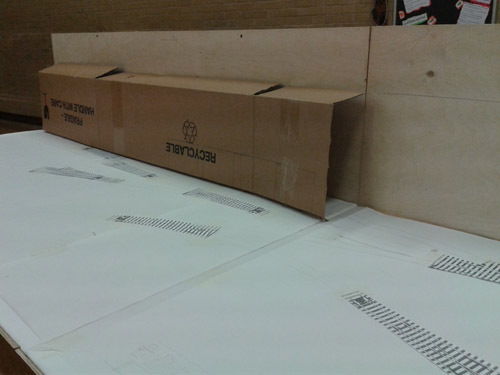 The laser cut warehouse in situ. 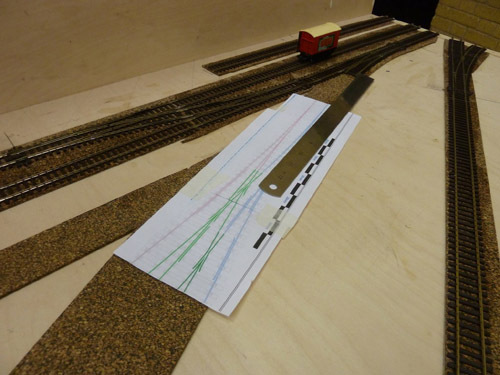 Test running part of the track to test electrical continuity. The missing peice of track is the three way turnout that is being hand built.